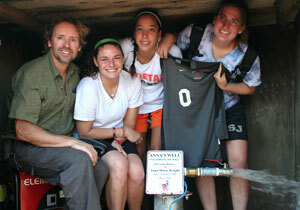 Women’s soccer coach Todd Olsen is featured in the current NCAA Champion Magazine for his successes on the field and in Uganda. Dr. Olsen has produced 16 winning seasons including 10 trips to the NCAA Tournament in the last 12 years. But much of his success has come in the form of giving back, and this summer he made his sixth trip to Uganda to help a struggling nation. With help from his players Cecilia Moore, Betsy Kwiatkowski, Grace Withers, Alicia LaPorta and assistant coach Catherine Adams, Olsen traveled to the Gulu District in northern Uganda in May. Check out the article in the NCAA Champion Magazine.